Pedro Tavares de Almeida is Professor of Politics, NOVA University of Lisbon. Javier Moreno Luzón is Professor of Modern History, Complutense University of Madrid. Electoral and parliamentary arenas play a crucial role in the configuration and dynamics of modern polities. This book explores the practices of citizenship and unveils the fabric of representation in the Iberian countries, during a significant period of liberal politics, that is, from its apogee to its collapse (from the 1870s to the 1920s). Part One examines the evolution of electoral norms and behaviour, as well as the recruitment profile of MPs. Portugal and Spain share fundamental features, such as the extensive clientelistic mobilisation of voters, the dissemination of fraud and corruption, the supremacy of governmental parties and the prevalence of the “politics of notables”. Part Two focuses on Parliament, questioning constitutional models, internal procedures, legislative action and political activity, as well as coetaneous perceptions and images of the institution and its actors as portrayed in novels, newspaper chronicles, cartoons and photographic reports. This collection of essays offers a detailed and cogent analysis, as well as a vivid picture, of the politics of representation in Portuguese and Spanish liberalism, revealing significant similarities and differences through cross-country comparisons. Focusing on the last half century of liberalism in the Iberian Peninsula, Portuguese and Spanish historians offer a comparative perspective on elections and parliament as two very important dimensions of the institutional and political development during the period. 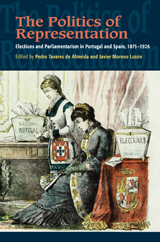 Among their topics are elections and parliamentary recruitment in Portugal; the political role and functioning of the Portuguese parliament; the parliamentary model of the First Portuguese Republic: legacies and discontinuities; and literary and cartoon representations of Spanish parliamentarism. A work of easy reading [...] which is of great interest because, throughout the various chapters, which are distributed very evenly among the authors, it can be stated that the monograph clearly illustrates the similarities and differences between the Portuguese and Spanish experiences. In addition to being of the highest academic quality, each essay in the book boasts its own historiographical originality. Therein lies another one of the work’s strong points: the various essays demonstrate a level of overall cohesion that allows the reader to delve into the political history of these two nations through different approaches and research methodologies. To that end, several of the essays make a laudable attempt to conduct a true comparative study of the two institutional histories, in a way that is meticulously and expertly carried out: indeed, the book does not limit itself to assembling a series of studies that focus on each country in isolation. In short, this is a suggestive monograph, which consolidates the path of comparative studies. [...] And it has the merit of having been written by authors who know how to mine that seam and achieve that most difficult of tasks: a certain community of interests and an important methodological cohesion. Historia Constitucional, Vol. 16, 2015. Undoubtedly, a model for future historiographical projects. A work of great significance, indispensable for informed reflection on the pluralistic political systems in the period covered. Le volume […] illustre au total l’avènement delicat et contradictoire de la modernité politique dans la Péninsule ibérique. […] les chapitres fournissent des elements argumentés, empiriquement fondés, articulés sous une forme didactique plaisante, pour saisir des aspects relativement méconnus. […].Une lecture riche pour tous les politistes convaincus de l’attrait des approches historiques. This volume provides important and compelling analysis of two cornerstones of the liberal constitutional regimes of Spain and Portugal: voting and parliaments. […] Collectively, the essays go beyond simplistic explanations for the “crisis of liberalism” that led to the rise of Franco and Salazar by exploring the function and practice of parliaments, giving texture to these critical years that are too often skimmed over. We now have a comprehensive collection of figures, data, and qualitative evidence to understand the political instability of this period. In other words, we now have a clearer picture of what the crisis of liberalism looked like for Spain and Portugal.